One of my best sustainable travel tips is to pack less, because less items means reduced fuel emissions on transport. It also means favouring solid, package-free toiletries over weighty bottles. And guess what? 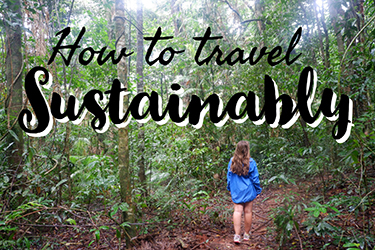 Sustainable travel is often also cheap travel, and travelling in this way could save you a ton of money. I hate spending money on unnecessary things, and to be honest, 20kg of luggage for 6 weeks in Asia seemed unnecessary to me – especially given the fact that I’d have to pay for extra baggage on four separate flights. I dislike flying at the best of times, without having to pay however much AirAsia wants to charge for extra baggage. So I decided to try my luck travelling with carry on luggage only in Asia. I left most of my belongings in my car, bought a carry on size backpack from Darwin, and put all I needed for those six weeks in this bag. People told me it wasn’t possible. They said it couldn’t be done. I let out a big evil laugh and said challenge… accepted. Of course, you can’t take any old bag and put six weeks of your life in there. If you’re flying with hand luggage only, it has got to be a strategic carry on bag that just fits into the size rack – the size differs from country to country but Skyscanner has a great guide about different airlines’ requirements. In Europe, North America or Australasia, you can probably get away with a hand luggage sized rolling suitcase. In Asia, however – with lots of uneven roads and tracks – a backpack is the way to go. If you’re going to be lugging it through the streets of Bangkok or around Malaysian island getaways for six weeks, you’ll most likely want it to be a backpack with a chest strap and waist strap. It’s got to be sturdy and zip up rather than buckle. And its great if it has a few separate compartments to keep your belongings organised. It’s also got to not naturally make your luggage heavier, so a soft material is desirable. There are certain things you can’t take in a carry on – and you’ll have to find a way around these if you’re travelling with carry on only. Liquids are the main one that you’ll normally be taking with you on your jollys that are prohibited in carry on bags. My answer? Solid everything. Lush sells completely vegan products with natural ingredients and zero packaging. This means that you’re not only dodging extra baggage fees, but you’re using great products that are saving the world too. Yay! You can get most Lush toiletries in solid form. I use the shampoo and soap frequently and absolutely rave about them. I stopped using conditioner one time when I ran out of money, and now see it as an unnecessary luxury (unless I’ve just finished a long road trip. THEN it’s a necessity, trust me). Lush also sell solid toothpaste which they call toothy tabs – these are great, albeit a little expensive, so unfortunately they too fall into the unnecessary luxury category for me – and solid deodorant. I used to love the solid deodorant, and still have fond memories of it – however after a certain amount of time it does seem to stop working. This is partially a good thing – it shows how long the bars last for – but also can be a bit frustrating. Here’s a post I wrote about other green travel products and gear, most of which fit inside a carry on. If you don’t want to use Lush or another brand’s solid toiletries, you can buy cheap toiletries in most places in Asia. It’s a great idea to get some travel sized bottles for when you first get out there and then stock up once you reach a pharmacy. I’m a book-a-holic, but if I only had 10kg of luggage to play with, I wouldn’t use 8 of that on books (actually, I probably would, but it’s not wise). Instead, purchase a kindle. These e-readers are the best on the market – they sync with your Amazon account where you can easily download ebooks, often at budget prices. A kindle is one of those nifty items that will save you money as you travel. You can’t take various blades into carry on with you – in the UK, generally blades under 6cm are ok, with blades longer not allowed. Check the full restrictions on the GOV UK website here. It may vary from country to country, so to be sure, check the restrictions for every country you are flying through and make sure any knives/ scissors you are carrying are ok. Carry on packing tips – what goes in? I washed my clothes fairly frequently (sometimes in the shower, but we won’t go too much into that…), and I really didn’t feel the need for more clothes. MINAMILISM IS COOL KIDS. Amazingly broken, yet amazingly still working $90 Telstra phone (the one all travel bloggers are queueing out the door to purchase – you heard it here first) and charger. A water bottle – I really recommend the water to go bottle, which can filter any water apart from saltwater! Collapsible tupperware – perfect to put cut up fruit and veg or leftovers in. Try to have specific places to put things. When putting a lot of stuff in a small bag, doing this is a lifesaver – if you know exactly where everything should be, it’s a lot less likely you’ll lose stuff. Take a canvas bag when you’re travelling with hand luggage only to use as a second bag when you’re travelling around the country – this works really well to keep every day items together and means you don’t have to lug around your hand luggage backpack every day. Some travellers swear by packing cubes – using these, you can cram extra clothes into your hand luggage. I’ve never got around to using these – as aformentioned, I don’t reaaaally own that many items of clothing – but the foolproof rolling technique has never let me down. 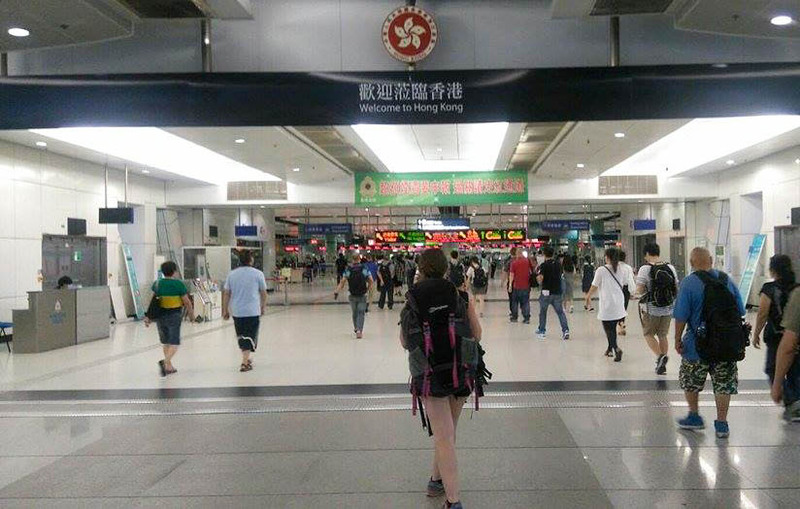 And that’s how I did it – travelled in Asia for six weeks with just a carry on! 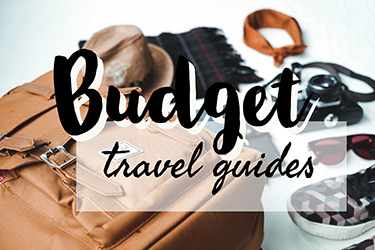 Do you have any tips for travelling with hand luggage only that you’d like to share? Let me know by commenting below or connect with me over on facebook! P.S. Some of the links in this post are affiliate links. If you make a purchase through these links, I will get a small commission at no extra cost to you. This is just one of the ways I keep this blog running! 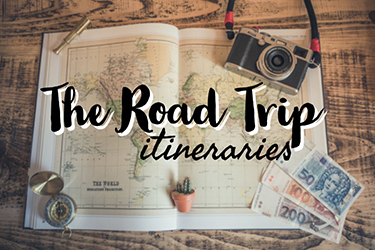 Hello, my name’s Claire and I’m obsessed with travelling overland. Seeing how cultures change while travelling slowly captivates me; and doing so in an eco-friendly way, preserving the cultures and landscapes that so many travellers yearn to explore, has given me my travelling purpose. 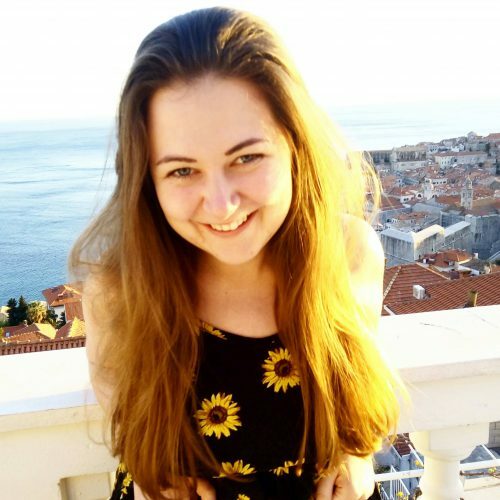 Claire’s Footsteps is a blog dedicated to helping the world through sustainable travel. Join the newsletter and start travelling with purpose.